Strong, purposeful Aries-Goat clearly understands what he wants from life. Although others consider him a mysterious person, unable to understand his preferences. According to the combined horoscope Goat-Aries — a contradictory personality with a complex character. Has a fair share of independence and stubbornness, does not tolerate peace and tranquility. The frenzied Goat can not in any way determine the goals and desires, and most importantly, do not worry too much about cares and worries. But ambitious, stubborn Aries aspires to achieve success at any cost, can not sit idle. People of this combination are in constant movement, they are always looking for something and are waiting for something. Sometimes they themselves do not know what is the reason for their emotional throwing. The union of the willed Aries and the ambitious Goat gives rise to motivated people who are firmly defending their interests. They can be different: stubborn and complaisant, capricious and friendly, prudent and impulsive. However, Goat-Aries are not capable of deception and meanness. Always stand for justice, frank and straightforward: they say exactly what they think. The main feature of the Aries-Goat sign is honesty. This person does not accept lies and deception in any form. Independent, freedom-loving, does not need anybody’s support, especially will not go on a deal with a conscience for the sake of gain. Do not tolerate ambiguous situations, always and in everything seeks to achieve justice. Openly expresses his opinion, does not curry favor and does not ask for condescension. The freedom-loving Aries-Goat does not tolerate limits and limitations: it is ready for dialogue, but not for obsessions. He treats his friends and relatives with great trepidation, trying to surround them with care and attention. But with strangers especially not ceremonious: polite, tactful, but no more than that. Perhaps some detachment helps him avoid serious conflicts. Aries-Goat is touchy, vindictive: does not forgive betrayal, hard quarrels and scandals. Rash is capable of saying a lot of superfluous, but not in its interests to spoil relations with others. Therefore, Aries-Goat maintains a trusting relationship only with close people, and communicates with the rest. He has a reputation as a nice, friendly person, quite content with his life. Charming, talkative Aries-Goat sometimes falls into despondency, becomes withdrawn and morose. Although it is usually easy to find a common language with people, it feels comfortable in any company. He is active, energetic, loves noise, vanity and fun. But sometimes he needs silence and calm, he wants to remain alone with himself, so that he can think about all the accumulated problems slowly. Aries-Goat is aimed at success, can not accept defeat, especially if others fail to witness its failures. He is proud of himself, proud, very much appreciates his reputation. Do not get involved in questionable cases, and make him act against the will is impossible. Usually happily escapes trouble, and if he encounters difficulties, pretends that everything is in order. Aries-Goat in love does not hasten to share his feelings with others. He prefers to joke, trying to seem mysterious person. On a love horoscope, Aries-Goat is a devoted partner, sincere in showing his feelings. Falling in love, remains a straightforward and honest man, not inclined to betrayal and deceit. However impulsive, unpredictable, sometimes does not control himself. Differences in his mood are difficult to predict — a diverse palette of feelings and emotions: passion, resentment, jealousy. Having married, Aries-Goat remains true to its principles: freedom and independence are above all. Although he tries to be a good family man, he will never allow the other half to interfere in his affairs. He considers himself a leader, seeks to make all decisions on his own. At the same time it is open for dialogue, with it there is something to talk about. Careful and attentive to his family, devoted to the interests of the family. It happens quick-tempered, capricious and stubborn, but still gives the other half much more than minor troubles — love and loyalty. Responsible, decent Aries-Goats enjoy great respect and trust of colleagues. Differs diligence, dedication, always brings the case to the end. At the same time he is creatively gifted, well versed in art — there is no limit to perfection. Eloquent, charming, able to convince anyone of his own right. True, it is demanding, categorical in their judgments, but still tries to remain calm. In dealing with his subordinates, he shows himself as a wise, patient boss. Aries-Goat needs a quiet environment. Does not recognize any framework and boundaries, can not work if faced with bans and restrictions. Most often he chooses creative professions with a free work schedule: a writer, a journalist, an art critic. Aries-Goat will be able to become famous in the political arena if he learns to control the swings of his mood. Aries-Goat has no equal in oratorical art, the ability to persuade, defend his point of view, and he does not have the courage and firmness of character. 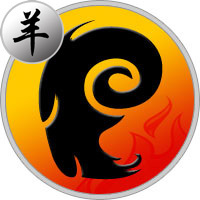 Active, energetic Aries-Goat man can find a way out of the most difficult situation. And it will make it so beautiful and elegant that it will also throw off applause. Nature has endowed him with great abilities, this is a real artist who knows how to infect others with his mood. He loves people and fellowship, but he will never tolerate liars and deceivers. The Aries-Goat man is an honest person, principled and very stubborn. He will stop at nothing until he realizes his dream. Undoubtedly, this is a creative nature, does not like frames and strict limitations. He will not tolerate control even from his beloved woman, he will fiercely defend his right to personal freedom. This does not mean that he does not have a strong feeling, just does not allow anyone to be higher than himself. Men in a relationship with a woman Aries-Goat will be very difficult, but life will be bright and interesting. This is an emotional, addicted nature that can not curb its passions, but most likely does not want to. However, this person is obligatory, therefore at work it manifests itself as a responsible employee. But in her personal life she follows only her own desires. She loves to travel, enthusiastically gets involved in love adventures. At the same time, the Aries-Goat woman is faithful and reliable, able to support in difficult times. The strength of her character allows you to adequately survive unpleasant moments and at the same time to help your neighbor. True, a man must give her the role of leader and reconcile with the natural stubbornness of this woman.